Previously we mentioned about Intel demonstration of Moorestown prototype during IDF event held in Taipei last year, now seems that Elektrobit, a Finland based company has also came out with an actual reference design powered by this powerful processor. The new MID (Mobile Internet device), co-developed by Intel and Ericsson is further enhanced with cellular and media phone capability, on top of common features available in typical MID. 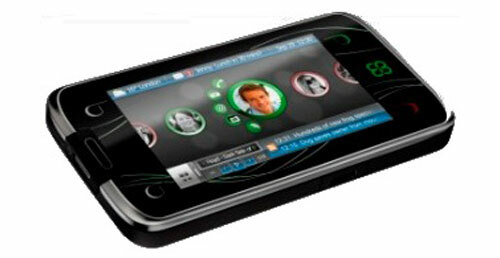 Some of the feature sets include a 4-inch touch screen LCD display with embedded speech recognition feature. Besides, it features with GPS (Global Positioning System, wireless WiFi technology, optional WiMax or HSPA upgrade via plug-in module as well as expansion SD slot. Surprisingly, the prototype is further designed with HDMI that allows users to extend the HD media playback to external screen, All these are made possible thanks to the tiny, thermally efficient but yet powerful Lincroft core, with integrated graphics and memory controller capabilities combining with Langwell IO hub embedded in the portable device. No pricing and availability yet, the reference design will be preloaded with Linux-based Mobin v2 operating system that being optimized specifically for Intel based MID for greater visual and desktop-like mobile computing experience.